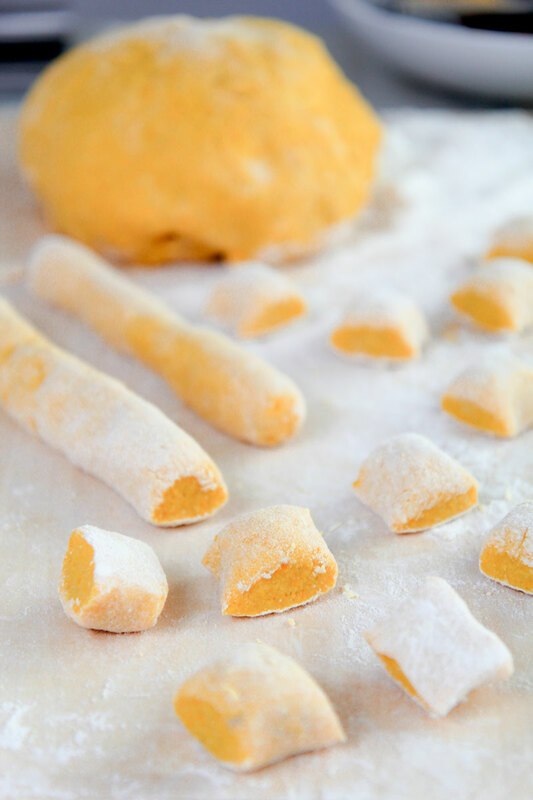 PUMPKIN GNOCCHI RECIPE - how to prepare them homemade! 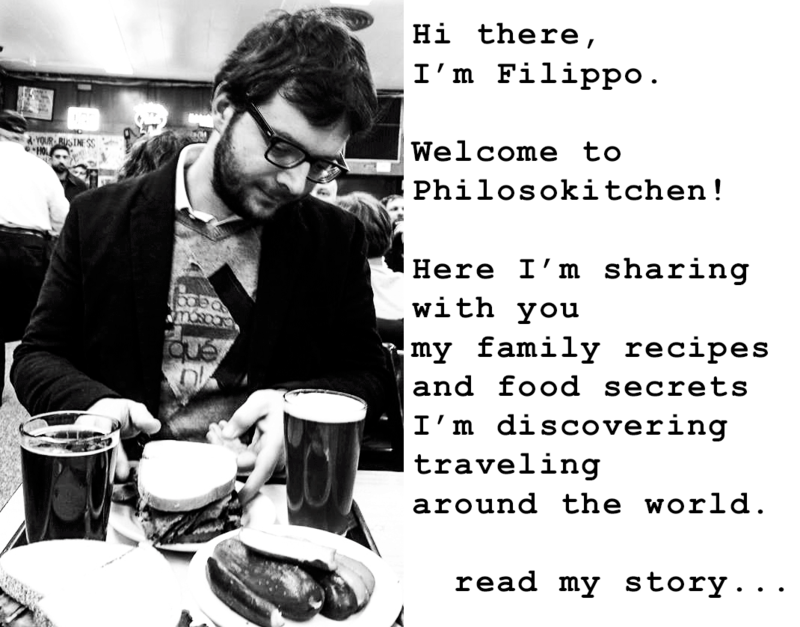 You are here: Home / My Authentic Italian Recipes / PUMPKIN GNOCCHI RECIPE – how to prepare them homemade! 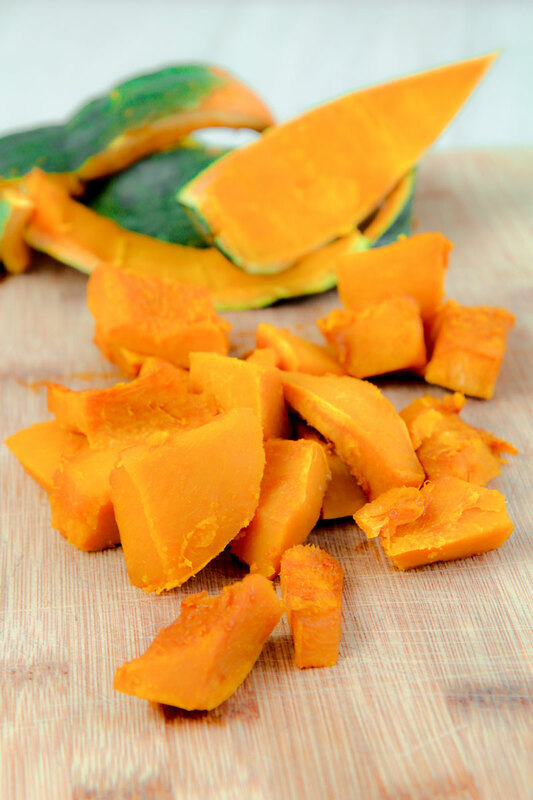 First of all, reduce the Buttercup pumpkin into slices, then discard the seeds and fibrous parts. 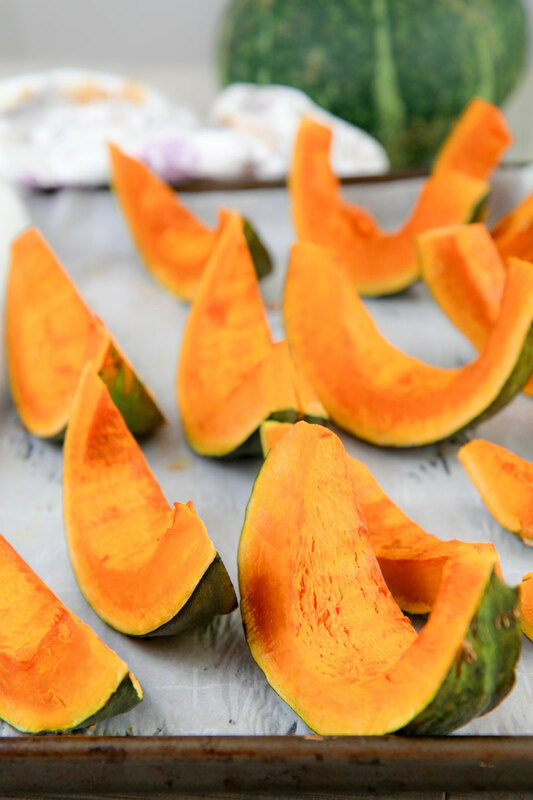 After that, place the slices on a tray lined with parchment paper and bake at 355° F (180° C) 40-45 minutes, until the pumpkin pulp is golden and soft, flipping the slices on the halfway. Finally, peel the buttercup pieces and let them reach room temperature. While the pumpkin is in the oven, Brush the potatoes pour them in a pot, skin on. Cover the potatoes abundantly with cold water and place over high heat. Cook the potatoes until well done but still in shape. Now, raise the potatoes and peel them as soon as possible. Finally, let the potatoes reach room temperature and dry perfectly. First of all, check the potatoes and pumpkin: you want them externally as dry as possible, but still tender. Now, mash the potatoes with a potato ricer directly on a wooden board. 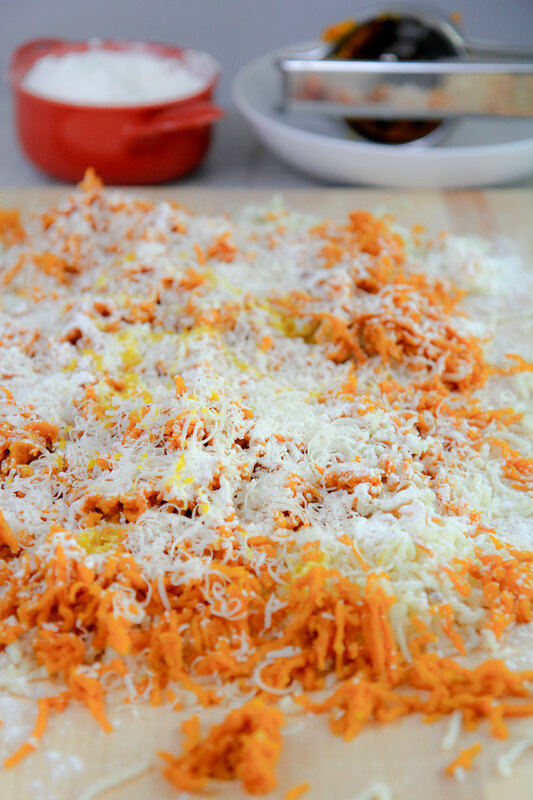 After that, mash the pumpkin pulp over the potatoes layer. Finally add the grated Parmigiano Reggiano, 1 dash of white pepper and 1 pinch of nutmeg. Eventually, cover all the ingredients with 1.5 cup of flour and 1 lightly battered yolk. Knead the dough until consistent with your hands and a pastry scraper. 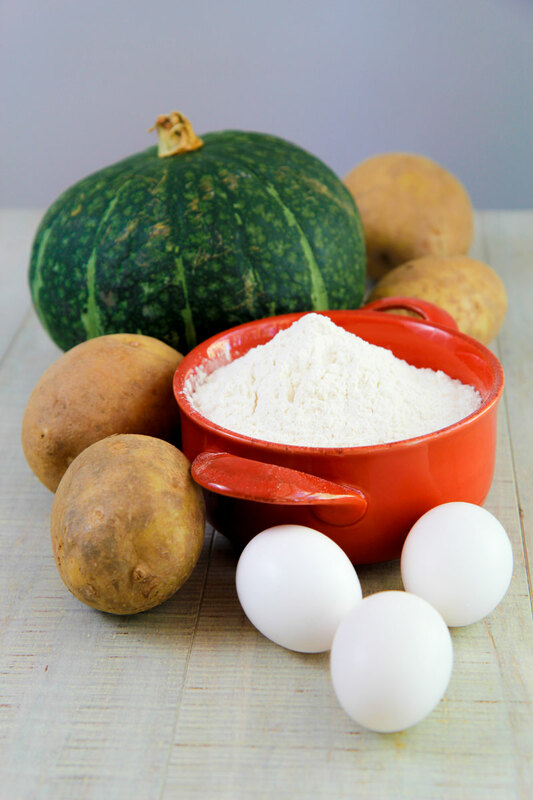 If necessary, add the remaining the flour: the right quantity depends on the humidity of the ingredients and the air! Once the dough doesn’t stick anymore is ready. It’s critical kneading the mixture as less as possible. Cut the dough into chunks and shape them into logs. I love my pumpkin gnocchi big and rough, so I form the logs 1 inch thick and cut them into cubes. But, you can make them thinner and mark with a fork as the tradition wants. Once ready, the pumpkin gnocchi have to be cooked within one hour and can’t be stored in the fridge. 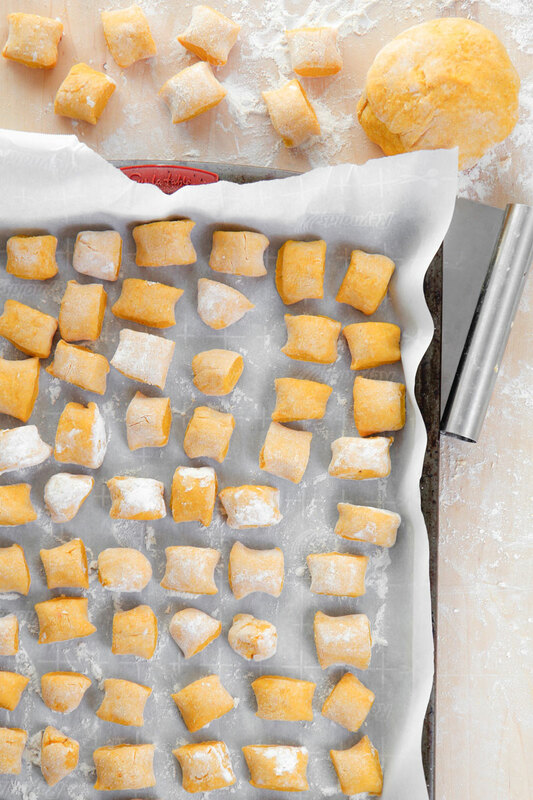 If you prefer to make gnocchi in advance, the only way is freezing them. 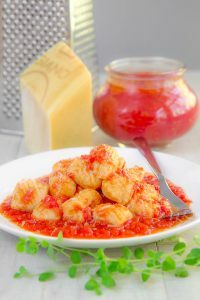 To store gnocchi, place them, well separated, on a tray lined with parchment paper and a thin film of flour, then freeze until hard. After that, transfer the gnocchi into plastic bags and conserve in the freezer until ready to cook. To cook the gnocchi, fill a pot with 5 Qt. of water and 4.5 tbsp of coarse salt, then bring to boil. After that, pour the gnocchi, frozen or fresh, and cook until they start to rise from the water. Raise the gnocchi with a slotted spoon and season immediately. 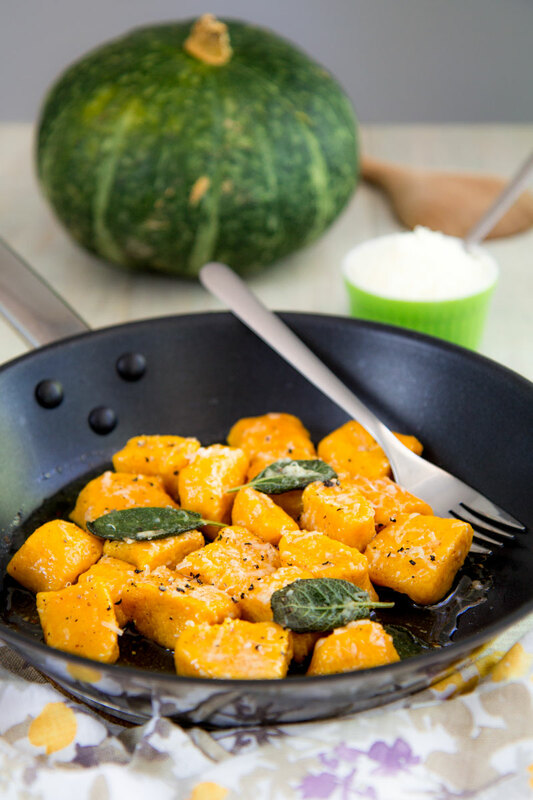 Choosing the best seasoning, keep in mind the mild sweetness of pumpkin gnocchi pairs perfectly with intense flavors. Among the several sauces, two of them are considered particularly traditional. The first one is an easy butter, sage, and Parmigiano Reggiano cheese. Just heat a pan and melt the butter along with sage leaves. Now, saute the boiled gnocchi and complete with plenty of cheese and a sprinkle of black pepper. 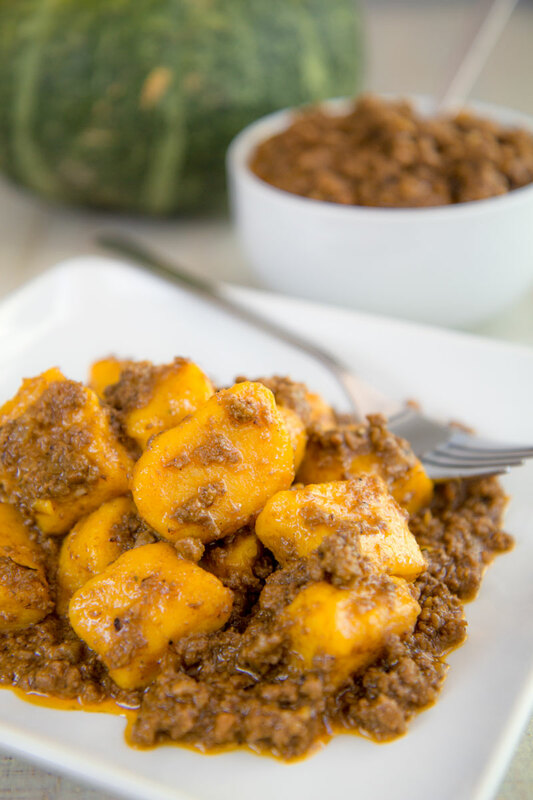 Another tasty way to serve pumpkin gnocchi is tossed with meat sauces like Ragu Bolognese, or lamb, or wild boar. Knead the dough until consistent with your hands and a pastry scraper. If necessary, add the remaining the flour: the right quantity depends on the humidity of the ingredients and the air! Once the dough doesn't stick anymore is ready. It’s critical kneading the mixture as less as possible. Remember that the timing from the dough to the gnocchi has to be as close as possible. Work all the time on a thin film of flour. 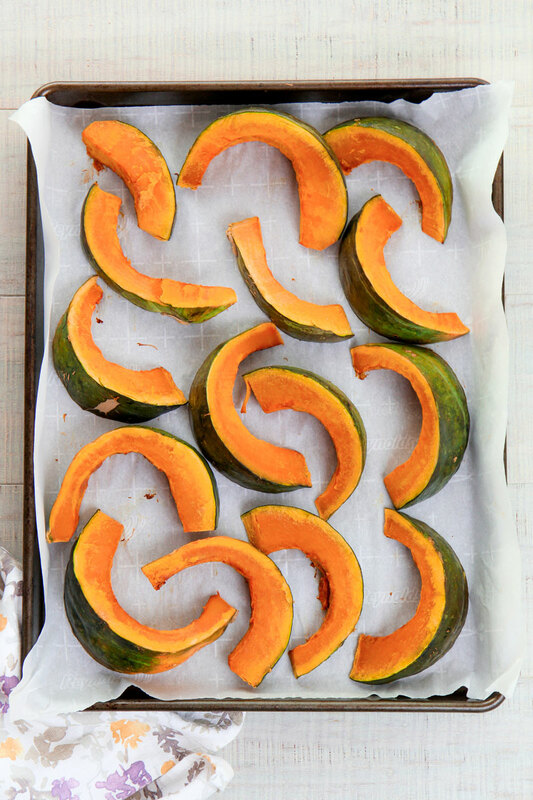 Once ready, the pumpkin gnocchi have to be cooked within one hour and can't be stored in the fridge. If you prefer to make gnocchi in advance, the only way is freezing them. To store gnocchi, place them, well separated, on a tray lined with parchment paper and a thin film of flour, then freeze until hard. After that, transfer the gnocchi into plastic bags and conserve in the freezer until ready to cook.